The Ultimate Christmas Experience encompasses three days and nights of the best of luxury accommodation, dining & entertainment. Let the exceptionally festive backdrop & ambiance of Hayfield Manor envelop you as you are welcomed to with a seasonally themed Afternoon Tea service. Spend a leisurely afternoon discovering the delightful amenities of your Christmas retreat, which include The Drawing Room, The Library, The Manor Bar, Orchids Restaurant, Perrotts Garden Bistro & the sanctuary of The Beautique Spa. Perhaps take the opportunity to do a little last minute gift wrapping or settle yourself in one of our resident lounges to reconnect with loved ones. As afternoon becomes Eve, soak up the cheerful atmosphere while sipping warmed mulled wine & being serenaded with heart warming Christmas carols by our local choir. Your evening celebrations continue with a festive meal of the finest local fare. Following evening ceremonies or as a nightcap, enjoy warming hot port & mince pies in front of an open fire. Christmas Day begins with Hayfield Manor’s famous Irish breakfast. Spend the morning relaxing in the luxury of your room or in a cosy corner in one of our resident lounges. Christmas Day celebrations commence in earnest with a Champagne toast which precedes our Traditional Christmas Lunch - a gourmet spectacle prepared by our Head Chef featuring all your traditional festive favourites. As the day advances, excitement grows as we await the appearance of Santa Claus who surprises our enthralled junior guests with a carefully selected gift for each. The evening culminates with a light buffet supper, thereafter relax by the fire with family and new found friends to enjoy the enchanting tones of classical piano, or retire to the peace and luxury of your room for the final hours of Christmas Night. St Stephen's Day begins with a leisurely breakfast. Thereafter opt to visit The Beautique Spa for some rejuvenating therapies or perhaps take the to the city's streets to enjoy the excitement of the commencement of the sales season. In the evening, our musical entertainment will add a lively note to the enjoyment of your St Stephen's Night dinner. As bedtime beckons, slip away for a peaceful last night’s slumber at Hayfield Manor. Christmastime at Hayfield Manor is a truly magical experience with little touches throughout, like a thoughtful bedtime gift each night, to make this Christmas your most memorable. We look forward to welcoming you as you join us for this most magical Christmas experience. 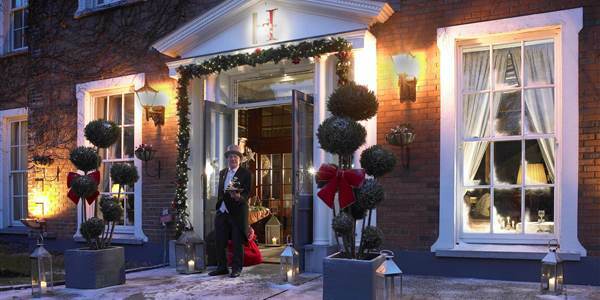 For all the delightful details of Christmas at Hayfield Manor, please click here. Price: From €1,595 per person based on two people sharing. A supplement per night applies for single occupancy. Please contact our reservations coordinators on +00353 21 4845900 or e-mail to enquiries@hayfieldmanor.ie for more details, for details of our wonderful Children’s Christmas or to request details of our excellent value pre & post Christmas accommodation rates. A member of our reservations team will contact you once your booking has been made to confirm your reservation and payment details. Please note: To redeem gift vouchers bookings must be made directly with Hayfield Manor's reservation office. It is not possible redeem vouchers via internet bookings.